If you need to return an item, simply use the contact us page, please include your order number, we will provide a unique RMA number to put on the package for returning, We’ll notify you via e-mail of your refund once we’ve received and processed the returned item. All parcels returned as undelivered will have the cost of the product refunded, a fee of £6.50 is applied for the return shipping from the dedicated courier, and these fees are unavoidable and must be paid. If you wish for the item to be despatched once again there will be a further delivery fee applied before the goods are resent. Please ensure someone is home to sign for your goods, login and track your order often to ensure you know when the item will be delivered to avoid unnecessary fees. *** Free Delivery items will also have a return fee of £5 fee applied, as the cost of delivery has been applied to your order we cannot claim this fee back from the carrier who has attempted delivery of your items, please ensure your address is accurate as failure to supply accurate information or collect items will automatically have this fee applied..
SAS Nutrition have developed a strategic partnership with Royal Mail, DPD, for cost effective and rapid delivery. Royal Mail 1st and 2nd class delivery is available for orders weighing less than 1kg – orders over this amount will default to standard delivery by carrier. The exact delivery cost is clearly available when viewing your shopping basket. You can monitor every step of your order’s progress online with a unique tracking number. All orders have an account progress page, you can watch as the orders pass through our system, simply login with your user name and password. All 24/72 Hour Delivery orders placed Mon – Fri by 12:00 will be dispatched the same day*. Orders dispatched on a Friday will arrive 24/72 hours of the next week. Orders received after 12:00 will be dispatched the next working day, dependent on product availability. Items ordered over a Bank Holiday will be dispatched the next working day. Items ordered the day before a Bank Holiday (express delivery) will be delivered the next working day following the bank holiday. Standard Parcels may arrive the following day but may take up to 4 days. All stages of despatch are notified to the email attached to your order, please check your spam folder if you are not getting the notifications. All consignments leaving SAS Nutrition will be tracked and these tracking numbers for both Couriers and Royal Mail will be made available in your ‘My Account’ area on dispatch of your order. Should your order be undeliverable i.e where Royal Mail or Specified Courier try to deliver the item and there is no answer at the delivery address, a card will be left advising the location of the local depot for collection or to arrange re-delivery. Courier will make two delivery attempts before the order is returned to SAS Nutrition and at any time you can contact SAS Nutrition via phone or email to arrange delivery. Should a package sent through Courier be returned to us undelivered (due to Courier not being able to deliver for reasons outside their control) you will be liable for a return charge of £15.00 to cover the shipping back to Courier. On re-delivering the item to you, we will ask for another shipping fee – once this amount has been paid, we will re-send the item. 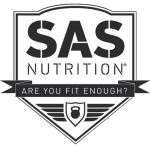 SAS Nutrition have no liability to you for any delay in delivery, or for any damage or defect to goods delivered that is caused by any event of circumstances beyond its reasonable control. During transport network delays, strikes and adverse weather conditions SAS Nutrition will endeavour to keep you updated with the extent of any delays. Where any of the products on your order are not in stock at the time you place your order we will notify you immediately, any items not in stock will revert to a back order status. Delivery to more remote areas may take slightly longer than estimated delivery times. All shortages must be notified to us within 48 hours of receipt of your parcel, to ensure a speedy investigation is carried out. Should a package sent via Royal Mail fail to be delivered please report it to us by email or using our contact form. We will do all we can to help but please note that as advised by Royal Mail we must allow a period of three weeks from the expected delivery date (and be advised by Royal Mail that the package is irretrievably lost) before any action such as sending a replacement item(s) or cancelling the order and processing a refund can be made. Delivery and/or re-direction charges will apply if an incorrect address or incorrect address details are provided and a package has to be re-routed or re-sent after it has left our dispatch centre. A standard charge of £12.50 is payable. When your order is dispatched you will receive an email confirming your order is being delivered. In most cases, the email will have a link to your ‘My Account’ facility which has the Courier or RoyalMail.com Tracking number. If you are worried about the whereabouts of your order, you will be able to view the status of your delivery by visiting the courier or RoyalMail.com Website and enter your tracking number in the tracking box. Please note you will not receive a Tracking Number until your order has been dispatched from our warehouse and status set to ‘shipped’. Please only try and track your order after you have received an email informing you your order has been shipped. This will normally arrive after 4pm on the day the order is dispatched. Please allow a further few hours for your number to become valid. We offer Royal Mail delivery (2-4 days) for Northern Ireland, Isle of Man, and Scottish Islands. Scottish Highlands and Isles: Inverness IV3-36, IV40 & IV52-54, Isle of Arran KA27, Isle of Canna PH44, Isle of Coll PA78, Isle of Colonsay PA61, Isle of Cumbrae KA28, Isle of Eigg PH42, Isle of Jura PA60, Isle of Rhum PH43, Isle of Skye IV41-49, IV51 & IV55-56, Orkney KW15-17, Paisley PA20-49 & PA62-77, Perth PH17-26, PH30-41 & PH49-50, Shetland Isles ZE1-3, Western Isles HS1-9. Delivery terms for Royal Mail are as above in the Mainland Delivery section. In general, delivery to Islands and more remote areas may take slightly longer than estimated delivery times. In addition to the United Kingdom we can deliver to the following countries on request: Austria, Belgium, Czech Republic, Denmark, Ireland, Finland, France, Germany, Hungary, Ireland, Italy, Luxembourg, Netherlands, Poland, Portugal, Spain and Sweden. The fee for the above non-UK European countries varies between £8.99 and £29.99. Prices for each country are available ON REQUEST.